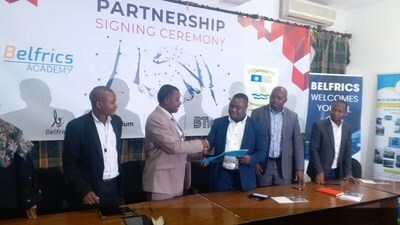 DAR ES SALAAM, Tanzania, April 15, 2019 /PRNewswire/ -- Belfrics Group, one of the largest international blockchain conglomerates of the world, in association with Dar Es Salaam Institute of Technology (DIT), one of the leading technology and engineering institutes in Tanzania and the East African region, today announced a joint initiative to develop a pool of talented and skilled technology professionals for blockchain as a domain. Belfrics Academy SDN BHD, the research, international training and skill development vertical of Belfrics Group of Companies, would lead the efforts to address the knowledge-gap and the rapidly growing requirements Blockchain Talents in the industry. On this momentous association, Mr. Praveenkumar Vijayakumar, Founder and CEO -- Belfrics Group of Companies said, "We all know that the Internet is filled with the so many online courses on Blockchain technology. But the sad reality is that, the quality of talent and knowledge that is out there, is not even close to what the industry needs. There is still a humungous knowledge-gap, and a huge void in terms of the quality and quantity of blockchain talent in the market. This is not only an Africa problem; this is a world problem! And we are happy to have associated with an esteemed institute like DIT which is synonymous with technology as an industry." "We are pleased to see educational leaders like DIT come forward and being open to the need of the industry. I would say, that this is the right time, between being proactive or before being reactive to the industry demands. Employment and development is Key, and for that we must understand where the future is. DIT is doing just that. In fact, we're pleasantly surprised to see the level of awareness and requests from other prestigious institutes from the East African Region for blockchain skill development. Since we are one of the major blockchain talent hirers ourselves, we are very much aware of the quality and quantity of the talent available currently. Such collaborations are required to address the current gap," says E C Uday Senan, Global Strategist -- Belfrics Academy. "Blockchain technology is among the emerging technologies that will soon revolutionize the internet and the ICT industry. Due to its inherent features, such as distributed system with no single point of failure, usage of cryptograph for data protection, and fast data transfer and sharing of digital assets, Blockchain has huge potential and a number of applications, particularly in developing countries. To leverage the potentials of this technology, it is critically important we create awareness of the technology as well as build the capacity of our students, staff and the general public. This is exact what DIT will do in collaboration with Belfrics. This will enable DIT to become the hub of blockchain technology, the hub where capacity building of our people as well as experimentation and eventually development of the blockchain systems for improving government service delivery will take place," says Dr Joseph W. Matiko, the Director of ICT Centre at Dar es Salaam Institute of Technology. "DIT is positioned to support the industrial economy by creating skilled workforce for the nation. Therefore, collaboration between DIT and Belfrics is important for capacity building of our students and staff and creating the digital skilled workforce in the country. We are really pleased to establish this collaboration because it is in line with our strategies of teaching factory concept and engagement of the industry in teaching and learning activities," says Prof Preksedis M. Ndomba, Principal of the Dar es Salaam Institute of Technology. "We are excited to partner with Dar es salaam Institute of Technology (DIT) on the launch of Blockchain Trainings for Corporates, DIT Students and Staff Members and the Tanzania Community at large. Blockchain Technology ensures digital skills are accessible to Tanzanians particularly youth and supports with securing meaningful opportunities where they can apply their talents, ideas and expertise to advance the Country's economic, Industrialization and social development," said Aziz Chonya, Director, Belfrics Tanzania. The collaboration between DIT and Belfrics comes in at a very crucial stage, with Africa being closely eyed as the next talent-hub by the world. With blockchain strongly anticipated to be the driver for the next stream of technological innovations, African countries "stand to benefit from this shift more than other nations because most of Africa has a Greenfield in banking, finance, health and other legacy infrastructure. Africa has a unique opportunity to leapfrog in many areas and develop new infrastructure and use cases to power the future" according to an article on medium. Belfrics is one among the very few companies who have developed and built their own blockchain, 'Belrium', which is now live and deployed, and which is being seriously considered as the technology carrier by many government bodies and conglomerates for solutions from identity data harmonization, to supply chain infrastructure, to smart governance infrastructure to healthcare infrastructure, around the globe.